ScottRasmussen.com is excited to announce that we are working with EyesOver to provide a social media monitoring service for Election 2020. Our initial application will cover the Democratic president nomination contest. With roughly three dozen announced and potential candidates, traditional polling will not always be able to adequately capture the ebb and flow of who’s gaining and who’s lagging behind. 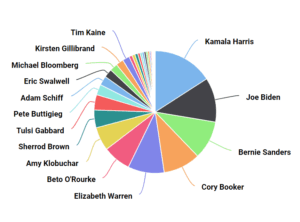 As of Monday morning, Senator Kamala Harris leads the pack in terms of social media chatter. She is followed by former Vice President Joe Biden, Senator Bernie Sanders, Senator Cory Booker, and Senator Elizabeth Warren. Booker’s inclusion in the top five highlights one unique aspect of this service–the ability to capture emerging trends. Booker entered the top five only after he officially entered the race last week. Many times in the world of social media chatter, these bounces come and go quickly, often in a matter of four days to a week. One exception so far has been Harris who got a huge social media bounce with her announcement and has retained much of it for now. It is important to recognize that this is not a poll. ScottRasmussen.com is working to refine our presentation of this data to clearly make that distinction. Near the end of general election campaigns, the social media chatter often reflects the poll results but that’s a long way away at this moment. Our hope in presenting this information is that it can help identify emerging trends and themes that might be missed in polling. However, we will then want to test those themes with our more traditional research. Beyond showing who’s up and who’s down, the social media monitoring project will also help us identify the context in which each of the candidates is being discussed. Are they part of a conversation on health care, the economy, or racism? The social media monitor developed by EyesOver measures both the level of chatter about a candidate and whether that chatter is positive or negative. We will begin a regular presentation of this data in the coming weeks and provide additional details on the methodology at that time. We will also roll out some additional uses of the social monitoring tool.